The most common question = "Are the seas rough, will I get sick?" A bit of heaven must have fallen from the sky to form the Azores. San Miguel Island is drop dead gorgeous. It's called “Ilha Verde” (Green Island). You'll see dairy cattle in the hills and well manicured, whitewashed buildings which remind me of Switzerland. It has a tepid, oceanic, subtropical climate with 60-76 F day and 52-66 F night temperatures. It never gets cold. Volcanoes created the island with rolling hills, black beaches, steep cliffs along the coast, impressive rock formations, lakes set into craters, geysers, and hot springs. Sixty plant species are unique and plants that grow in other parts of the world are transformed to new forms and growth habit. The scrub brush of juniper grows to become commercial timber in the Azores. There are hydrangea hedges and 700 varieties of plants introduced from around the world that thrive in the Azores. In the summer, the landscape is filled with flowers. 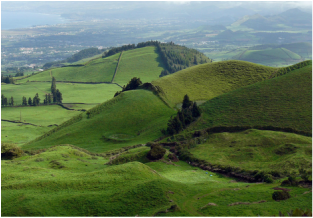 The Azores are unique, unspoiled, in the middle of the ocean. You may never have a chance to see it again. Take advantage of your cruise ship's stop. PLAN AHEAD – do research and plan how to spend your limited time in this heavenly location. Madeira is a beautiful, mountainous island with high cliffs overlooking the sea and picturesque villages along the coast. The temperature is a near perfect 64-75 F year round. The mild climate, adequate rainfall, and rich soil create an abundance of gardens with over 2500 species of plants and lush vegetation in the mountains to create the largest laurel forest in the world. There are many things to see and do. My port guide describes 72 point of interest. You can't do it all. You'll have to choose between exploring center city markets, museums, churches, botanical gardens, shopping for wine and embroidery, cable car rides, nature trail walks, and/or going into the mountains and visiting fishing villages along the coast. If that's not enough, there's also the possibility of whale and dolphin watching. Port days and sea days are entirely different. On port days, the focus of almost all the energy on the ship is on helping people with shore excursions. If you are staying on the ship while in port, you will be pleased to know that Princess may be the only cruise line that still has some, albeit limited, entertainment activities on the ship while in port such as showing movies. On sea days, the focus is on relaxing and enjoying activities on the ship. I like seminars on photography. My wife likes cooking demonstrations. We both enjoy a first run movie, presentations by the officers, and the "scholarship at sea" lecture series. If you want excellent lectures on a cruise ship, consider Cunard. The Brits are very demanding and have high standards. Cunard ships have an outstanding lecture series and some unique entertainment venues in addition to Broadway-style shows that are available on most cruise ships. Are the seas rough on a Transatlantic crossing? Will I get sick? These are the most common questions I get about Transatlantic Cruises. I don't know if you will get sick. My wife and I have crossed the Atlantic four times on Cunard between UK and New York and eleven times on Princess between Florida and Venice. We have never gotten sick, but have seen people get sick. Presentations are instructive by navigators on Cunard and Princess about their Transatlantic crossing. The navigator on Cunard emphasizes sailing on an Ocean Liner, not a Cruise Ship. The navigator on Princess emphasizes passenger comfort and safety. He shows the weather map between Florida and Venice and points out low pressure areas where wind and storms cause heavy seas. He explains our sailing route avoids low pressure areas and the ship's course/speed will be changed, if necessary, for comfort and safety. On one of four crossings we were in a horrific storm for 4 days. Many passengers got sick and threw up. “Q: Can you change course to avoid the storm? A: No, it covers too large of an area." My conclusion is that Cunard's transatlantic priority is speed. To minimize time of the crossing, their ships sail a direct, east-west route in a narrow north-south band of the Atlantic. When a storm is encountered, it may stay with the ship for much of the crossing. Hence, it makes sense to me that Cunard needs ships designed for heavy seas. All eleven of our Transatlantic crossings were pleasant. I believe smooth crossings are likely because Princess considers a huge area of the Atlantic and charts a course to avoid low pressure areas for a comfortable sailing. Speed is not the priority. There's extra time in the schedule to change course and speed, if necessary, for a smooth, safe passage. There's also time for stops at some fantastic islands along the way. On one of our Princess cruises from Venice to Florida, the captain announced an unexpected hurricane was forming near North Carolina. He reversed course and sailed at full speed back to the east for over a day. We were never in harms way, never saw large waves, nor experienced high winds. We arrived in Florida on schedule. Princess is my first choice for Transatlantic cruises. Princess charts a course and modifies it, as necessary, to sail in calm seas for my comfort and safety. All eleven of our crossings have been smooth and comfortable (knock on wood). Sometimes, the ship slows down and changes course to see a pod of whales. It's amazing!